The humble sandwich can also be a fabulously healthy meal – if you make it correctly. It’s possible to combine the perfect blend of protein, veggies and slow-release wholegrain carbs to make a nutritious and filling meal which is quick to throw together or take as a packed lunch or dinner. Here are the swaps you need to make the pep up the goodness and take the taste levels to dizzy new heights! Not only is white sliced bread pretty boring, it’s also a nutritional wasteland. Packed with fast release carbs which will send you running for the biscuit tin a couple of hours later, switching your bread will not only leave you feeling satisfied, it can also add taste and texture to your sandwich too. Choosing a wholemeal granary variety will increase the B vitamin, fibre and mineral levels of your sandwich and those malty granary bits will also add texture and flavour too. Likewise rye and spelt breads which are digested more slowly but also more easily by your body. If you hate a soggy sarnie then sourdough is your friend. Sourdough is also more digestible than processed packaged bread as the gluten in the flour has been broken down more than usual in the longer, natural rising process. It’s more nutritious too as the lactic acids make the vitamins and minerals in the flour more available to the body. It’s much lower on the glycemic index (GI), so it doesn’t cause spikes in insulin. Years ago we were encouraged to ditch butter for marg as it was lower in fat – now we realise that heavily processed trans-fats are just not good for us. In contrast butter, especially if you chose an organic butter which is made from milk from grass fed cows not only prevents your sandwich going soggy but also contains vitamin A, D, E and K as well as manganese, zinc and chromium. The fat is actually helpful as it will allow your body to absorb the fat soluble vitamins in the rest of your filling. 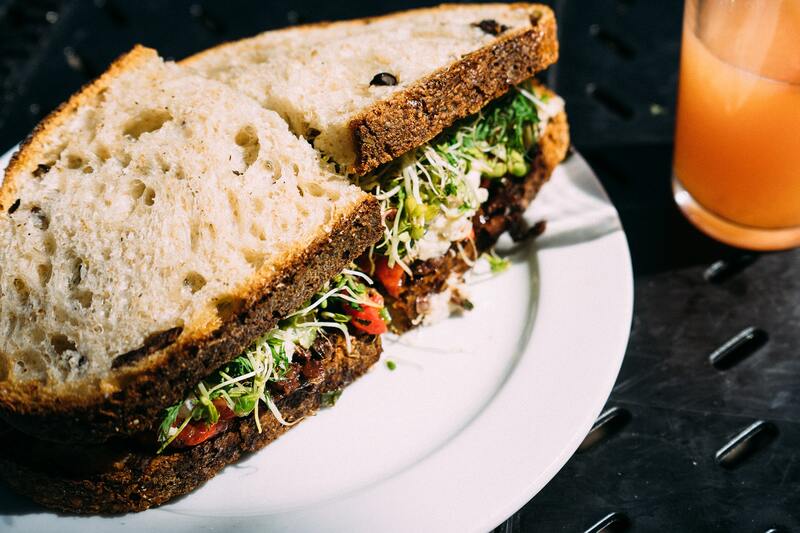 If you love lettuce in your sandwich just swapping it for spinach will make your sarnie more flavoursome and also bump up its nutritional content. The darker the vegetable, the more nutrients you’re going to get, spinach will give you more folic acid and iron than lettuce. Also try watercress which is very high in vitamin K as well as vitamins C, A and potassium. Ham and salami are certainly go-to sandwich fillings for many but these nitrate rich processed meats have been linked to early death from heart disease and cancer, particularly bowel cancer. Better to use home cooked meats which are leftover or a meat substitute like Quorn or tofu. Fish, prawns and eggs are also great to sub in for ham. Yes mayo is delicious in a sandwich but contain those dreaded trans-fats and one tablespoon can contain a whopping 90calores with not a huge amount else to add to the sarnie party. In contrast a tablespoon of low fat cream cheese contains 30 calories and also calcium, potassium and protein. If you love tuna mayo make a much healthier version by combining the drained tinned tuna with cream cheese, a squeeze of lemon and some ground black pepper – delicious! Or try this easy but yummy Smoked Salmon Pate. Condiments like mustard also pack a flavour punch without as much sugar. Adding fresh salad vegetables like radish, grated carrot, tomatoes and even some fresh apple adds flavour and texture as well as a wealth of health benefits, also helping you achieve your five-a-day easily. Beetroot looks and tastes delicious in a sarnie, try this Creamy Beetroot Pate.